Thanks to our custom wood shop, Eco Relics gets to work with some of Jacksonville’s greatest small businesses. The folks at Grassroots Natural Market recently contracted Eco Relics master fabricator Kris to construct a display shelf for their store. A Grassroots customer himself (sandwiches, smoothies, and Dr. Bronner’s Magic soap, an Eco relics favorite), Kris had a good idea what they meant when they said they wanted a natural look. 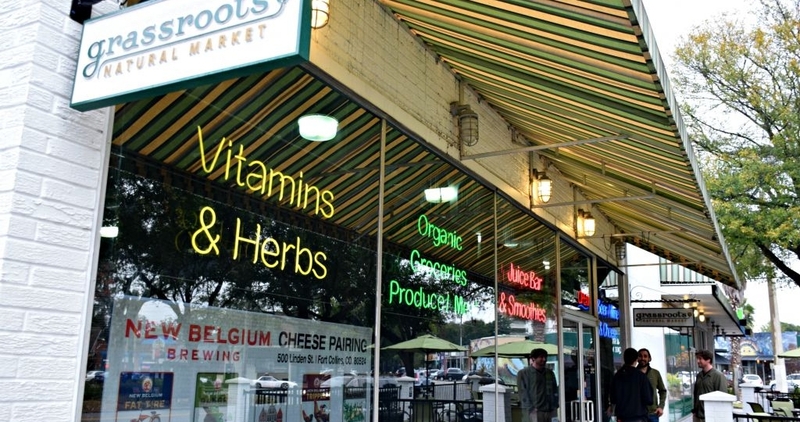 The Robison brothers, Jack and James, run the show at Grassroots, a natural and organic market featuring produce, groceries, household items, vitamins, a juice bar, and grab-and-go salads and sandwiches. I got a chance to speak with the local boys (Bishop Kenny for Jack, Episcopal for James) at the store. James started the family business in 2006, skipping a short-lived plan to get an MBA first. “I knew how to stock shelves, I knew products I liked,” James said. Rock-bottom prices and a friendly atmosphere would get the business launched. He would learn the rest as he went along. At first the Robisons tried to do everything but quickly found themselves stretched too thin. Friends helped staff the store initially but as they fell by the wayside, employees came to Grassroots from other local health food stores. James made sure the company invested in their education, giving employees the opportunity to develop valuable job skills and healthy lifestyle habits. Employees generally stay put now, aside from recent graduates vacating the cashier position. The management team has been in place since 2008. Grassroots has seen employees grow up, get married, have kids, buy houses, and even spin off their own businesses. “Now we sell them ingredients,” Jack said, with a hint of pride in his voice. Grassroots is a locally owned and operated business sourcing local products as much as possible in a highly competitive field of big box stores and national chains. When a certain big box market opened in 2008, Grassroots lost 30% of its business overnight. After having a peek at the competition, however, customers returned to Grassroots. From Riverside, it’s nearly 20 miles to the competition. “Why do that to yourself?” Jack asked. Grassroots customers agree. The business has sustained double-digit growth annually since opening, all in a storefront about the size of a big box store’s produce section. The size of the room is certainly no indicator of the variety available. Items are “single-faced” on the store’s tall shelves to allow for more diversity. Extra stock is kept next door instead of in the storefront. I lost count of how many carts whizzed past while we spoke; door cartridges are frequently replaced. Shelves are constantly restocked, allowing for an award-winning selection. While many grocery stores prefer a higher margin on “specialty” items, Grassroots keeps prices low with higher volume sales. Many items are sold at the lowest price point allowed by the manufacturer. More than once James has overheard a customer whisper “I will order this on Amazon,” only to see them back the next day. They confess, “It’s cheaper here.” With the lowest prices, huge variety, and top-notch customer service, many customers (and employees) find that Grassroots is the only place they shop. No reason to shop anywhere else! After 10 years in the same storefront in historic Five Points, the Robison brothers are not going anywhere anytime soon. Although they acknowledge that Grassroots could use more room, they don’t want to give up the Five Points location. Many of the same customers return every day, quickly getting on a first-name basis with the staff. Our short conversation was interrupted several times so the brothers could greet the customers that have become their friends.“It’s a real neighborhood,” Jack explains. Neighbors make a neighborhood, and Grassroots is a great neighbor. Be sure to stop by Grassroots for your Valentine’s Day needs, like organic chocolate, strawberry wine, cheese, and much more. Also, look for new aisle signage at Grassroots, made by Kris, coming soon!